It depends on who you ask. If you ask an accountant a dollar added to another is equal to $2. But if you ask a marketer a $9.90 merchandise is actually $10.00. Take the following case and you will understand why the Australian Competition and Consumer Commission, ACCC, filed a lawsuit against Malaysian budget carrier AirAsia. ACCC accused AirAsia of failing to disclose the full price of fares on its website. 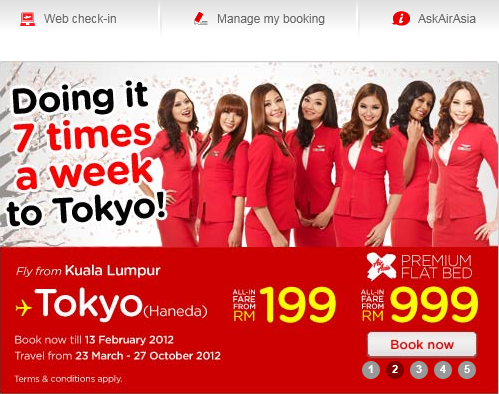 Very attractive, all-in fare starts from RM199.00 although not many seats are priced this low. Simple, and the offer is looking good! Almost all year around. To be fair to customers, All-in fare should read as "FROM RM257.50". For obvious reason the airline did not disclose the higher fare when flying back from Tokyo. Interestingly for Gold Coast-KUL-Gold Coast routes, both fares are displayed prominently. 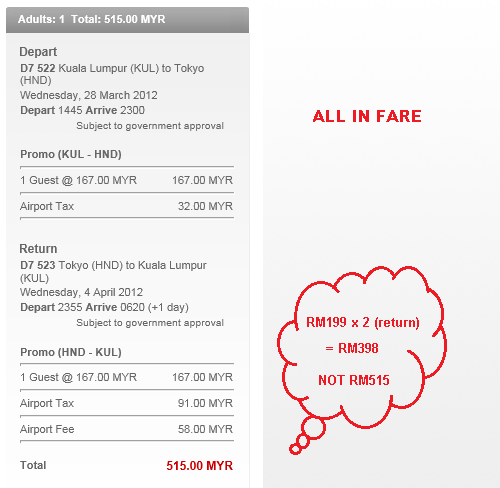 Clearly, RM199.00 is not the all-in fare. Finding out what's the airport fees and taxes in Haneda, Tokyo should not be the customer's, it's the airline duty to disclose them. 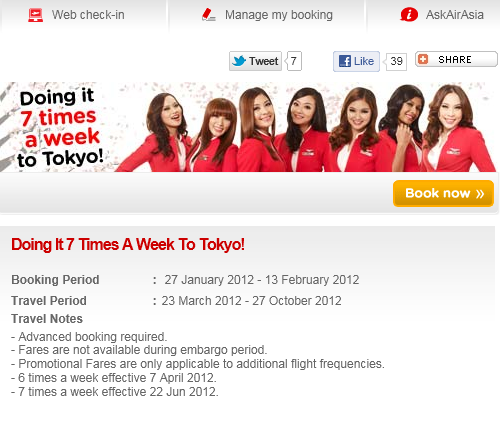 In this case, only the flight from Kuala Lumpur to Tokyo is correct as per advertised. I have nothing against AirAsia, in fact eversince this budget carrier started its operations my family has been using its services for leisure travelings, except for routes it has not covered yet. Malaysia Airlines for me is mainly for formal company trips. The above may not be an exact copy of what happened in the carrier's adverts for it's Australia website but the idea is still the same. The airline's advertisements always get me sceptical as most of the time the final total fare would be much higher than what is written as big prints in their commercials. We may not have a law specifying "Businesses that choose to advertise a part of the price of a particular product or service must also prominently specify a single total price", but as a responsible business entity this is the right thing to do. Consumers should not be faced with surprises after making online bookings and are ready to make payment. yea...felt cheated somehow...but it's not just the airlines but also Insurance company..or any agreement you signed..must look out for that 'small' little print that we so often overlook. yeah. i like this entry too. for those who constantly looking for good offer of flight ticket online, normally has already aware on the actual cost behind the price displayed. but no matter how high the additional cost is. air asia is still cheaper than MAS. cheaper la, but not very very cheap anymore. That's why I never take Air Asia's fare at face value. So many hidden costs. Still, AA has accorded many a chance to travel. Their 'now everyone can fly' I think is still relevant. It's high time someone sue them,always misleading people with their fares. Notwithstanding the misleading adverts I have to agree, as pointed out by some of you, that AirAsia is still the cheaper option compared to Malaysia Airline. "Now everyone can fly", well almost.